Which made me wonder: Of the many somebodies trying to make the world a better place, who is your favorite to bash? Did Michael Vick Get a Dog? Hurray for blood money and whitewashing of dog torture. Last week, Vick reportedly tweeted and quickly deleted a photo of himself and his daughter at home, sitting at a table that had a box of Milk Bones on it. He replaced it with a very similar photo but the box of dog treats had been removed from the table. Common sense tells us that Vick currently has some personal involvement with dogs (due to the box of treats) and that he wants to keep that information from becoming public (tweet-and-delete). Given that he has been expressing a desire to get a dog for some time, it seems a reasonable conclusion to believe he may have done so. But what are the legalities here? We tracked down (thanks to a reader who also is a lawyer) a copy of Vick’s sentencing order from December 10, 2007. And while the document states that “[t]he defendant shall not engage in the purchase, possession, or sale of any canine,” that limitation appears as a condition of Vick’s supervised release, otherwise known as probation. 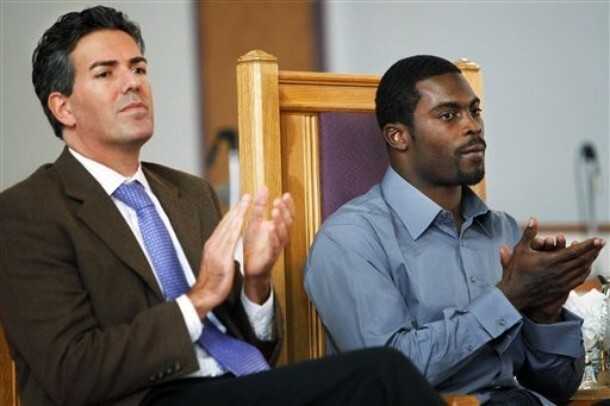 Vick was placed on three years of “supervised release,” which began to run after he was released from prison. Thus, at some point in 2012, he’ll no longer be on supervised release — and he’ll be able to buy, own, and/or sell dogs. My question is this: Has Vick’s probation officer (or anyone else) checked to see if in fact he does has some personal involvement with dogs and if so, whether he began owning, buying and/or selling dogs after the date allowed by the courts? And as a follow-up, if Vick did get a dog, I’d really, truly and sincerely like to know who on this planet gave him one? It was something that happened. Not torture and pain and death that he inflicted with his own hands on innocent dogs. Just something that happened. Like one day you are whisking around Munchkinland in your ruby slippers and suddenly a Kansas house lays you out. What has Michael Vick done to anybody? Number of days in prison Michael Vick served for torturing dogs? Zero. Number of animal cruelty convictions on his record? Zero. It was something that happened. Cat Got Your Tongue, Michael Vick? When HSUS got in bed with Michael Vick to promote their “End Dogfighting” campaign, many of us were skeptical. Nothing to date has changed my skepticism in that regard. You may have heard about a new app for the Android market called “Dog Wars”. Basically, you can play dogfighter on your phone. Yay. There has been a huge outcry from pet advocates, condemning the app and asking Android (owned by Google) to block it. Android tells advocates to quit bitching because “it’s just a video game”. I bet Android is happy that HSUS and Michael Vick have been mum on the controversy thus far. If you are opposed to the promotion of dogfighting as a game, sign this petition. It’s already got about 7700 signatures. I haven’t scrolled through to see if Michael Vick or Wayne Pacelle are among them. I imagine they are still working the “How can we fundraise off this?” angle and haven’t had a chance yet to publicly comment. I always find it difficult to report on animal cruelty stories. Some do touch me more deeply than others of course and such was the case with Phoenix, a Pitbull set on fire in Baltimore in 2009. A crowd of onlookers watched her burn until a heroic police officer arrived to douse the flames. Tragically, Phoenix was unable to survive, even with compassionate veterinary care funded by kind-hearted donors. Teen twin brothers were charged with the crime and set to go to trial January 19. While free on bail, one of the brothers allegedly tried to kill someone. So after facing animal cruelty and mutilation charges on the 19th, the now 18 year old Travers Johnson “is slated for arraignment Jan. 27 on charges of attempted murder, assault and handgun violations”. While it is indeed difficult for many of us to hear about animal cruelty stories, the link between violence against animals and violence against humans is well documented. We must get the courts to take animal abuse seriously. It only makes it harder when HSUS uses its massive PR machine to whitewash an animal abuser like Michael Vick. But don’t be fooled – people who torture pets require long-term monitoring in my view. And by monitoring I mean like the police knocking on your door unannounced periodically to see what the hell you are doing and to make sure you don’t have any pets. Remember, Vick never “paid his debt to society” for torturing dogs. He only served time for bankrolling his illegal dogfighting operation. Just because Wayne Pacelle thinks he should be allowed to have another dog or because he’s good at football doesn’t mean he’s not a candidate for police monitoring to my mind. Two words: Travers Johnson. Dog killer Michael Vick would like to get a dog. And HSUS president and dog killing advocate Wayne Pacelle supports the idea. Discuss. Update, 9-18-10: The winner of the book is Preston. Thank you to everyone who entered. You may well remember the December 2008 cover article of Sports Illustrated that featured the Vick dogs and was written by Jim Gorant. The publisher of a new book by Mr. Gorant called The Lost Dogs – Michael Vick’s Dogs and Their Tale of Rescue and Redemption is offering a free copy of the book to a reader. If you’d like to enter your name for the drawing, simply leave a comment on this post between now and Friday, September 17 at 11:59 p.m. I will draw one name at random and post the winner as an update to this post next weekend. Winner will also be notified privately and will need to e-mail me a mailing address so I can send that to the publisher. A BROWN DOG SITS in a field. There’s a collar around her neck. It’s three inches thick and attached to a heavy chain, which clips onto a car axle that’s buried so one end sticks out of the ground. As the dog paces in the heat, the axle spins, ensuring that the rattling chain won’t become entangled. The dog paces a lot, wearing a circle in the scrubby weeds and sandy soil around the perimeter of the axle. She paces because there’s little else to do. Sometimes a squirrel or a rabbit or a snake crosses nearby and she barks and chases it, or she lunges and leaps after the dragonflies and butterfliesthat zip and flutter past. She flicks her tail at mosquitoes and buries her muzzle in her fur, chewing at the itchy crawly things that land on her. If she’s lucky she digs up a rock that she can bat around and chew on, but otherwise there are just the weeds and the bugs and the hot sun inching across the sky. She is not alone. Other dogs are spread around this clearing in the trees. They can see one another, hear one another bark and whine and growl, but they can’t get to one another. They can’t run, they can’t play, they can’t anything. They can get close to their immediate neighbors, stand almost face-to-face, but they can never touch, a planned positioning meant to frustrate and enrage them. For some it does; for many it simply makes them sad. Out in the field are mothers, fathers, off spring, littermates. The families are easy to spot. There’s a group of sand-colored dogs, some with pink noses, some with black snouts. There is a group of red dogs, some small black dogs, a few white ones, a few black-and-whites. A handful of other colors and shapes are mixed in. All are pit bulls and many have that classic pit bull look, stocky and low to the ground, front shoulders higher than haunches and a wide muscular chest that dwarfs narrow hips, so that they look as if they’re waiting for their backsides to grow into their fronts. Their necks are thick and hold up rectangular heads. Some are bigger, as big as seventy pounds,while another group is more compact, reaching maybe twenty-five pounds. These smaller ones are actually Staff ordshire bull terriers, a close relative of the American pit bull terrier. The brown dog has a soft face, with searching eyes and an expressive brow that furls into deep ridges and undulating rolls when she’s scared or nervous or trying to figure out whether she needs to be either. Her uncropped ears rise from the top of her head until they fold over, but one of them folds differently from the other, so that it hangs lower, making her look as if she’s eternally asking a question. To help fight the heat, there’s water spread about in large tubs, sometimes a little dirty but drinkable. Once a day a man comes to put food in the bowls. At least it’s usually once a day. Sometimes two or three days go by before the sound of his all-terrain vehicle breaks the monotony. As he gets off the vehicle and makes his way across the clearing, all the dogs run to the end of their chains, barking and wagging their tails as if they’re excited to see him. But when the man actually gets close to them, they tuck their tails and skulk away. Only after he has moved on do they creep back over to their bowls and eat. A breeze stirs the trees—scrub pines and sugar maples, a few pin oaks. The lilt of songbirds mixes with the whine of cicadas and the low, singular whoooo, whoooo of a mourning dove. The summer heat draws moisture off the Atlantic, thirty miles beyond, adding the weight of humidity to the air. Within the perimeter of each axle there’s a doghouse. Rough-hewn plywood structures, they provide something else for the dogs to chew on and claw at to while away the hours. They also offer a break from the sun but not much relief from the heat—just as in winter they stop the wind but don’t do much to protect against temperatures that can drop into the thirties. Curled up in their little houses the dogs look and listen and sniff the air. They are incredibly intuitive creatures. They learn by watching—trainers sometimes let young dogs watch experienced dogs in action so they see how to behave. They can detect odors 100 million times more faint than people can. They can hear sounds at a broader range of frequencies than humans, and they can hear them from four times as far away. People who train dogs for search and rescue contend that dogs can hear a heartbeat from a distance of five feet, which gives them insight into the mood and disposition of the people and animals they come in contact with. As pack animals, they are keenly aware of the behavior of those around them. One dog can tell what another is thinking and intending simply by observing the way he acts. When two dogs meet, there is a detailed ritual of movements and gestures. The way they hold their ears, tail, head, their posture. Everything means something. Attitudes, feelings, intentions, dominance, and submission can be established immediately. So can achallenge. Dogs understand what’s expected of them. When people are around, dogs see what wins them rewards and praise and what leads to scorn. Something deep inside of them, woven into the very fabric of their being, a genetic impulse, compels them to please those around them. But sometimes, the things that men want from them cut against their natural inclinations, setting off an internal chain reaction of anxiety and uncertainty, triggering hormones and nervous system fluctuations. When they are extremely scared, dogs secrete a powerful musk that other dogs can smell from great distances. The things they see and hear and smell have an impact on them, too. Studies have shown that if two mammals are placed side by side in boxes and the first one is given electric shocks, just by listening to the suffering the second one produces identical brain waves and nervous system activity; the trauma isn’t limited only to the animal that’s experiencing the pain. Out in the field is the little brown dog with the floppy ear— none of the dogs know what’s happening around them, but they do know something isn’t right. They’ve seen things they are not supposed to see. They’ve heard terrifying sounds and they’ve smelled fear and pain drifting in the air. The brown dog lays her chin on the ground and exhales. Her brow folds into a furry question mark. The afternoon is fading and the heat has begun to fade too, but little else is certain. Sometimes men come and take a few of the dogs away. Sometimes those dogs come back tired and panting from running and running. Sometimes the dogs come back scarred and limping. Sometimes they come back looking the same, but acting completely different. Sometimes they don’t come back at all, as if they’ve simply disappeared. As if they’ve vanished into a black hole. Take a Check, Mr. Vick? When I was a teenager, I sometimes liked to get autographs from bands after the show. I don’t know where any of those signed ticket stubs and sharpied napkins are now but it seemed important at the time. I never got a professional athlete’s autograph so maybe that’s why it surprised me to read that Michael Vick will be selling his signature at a VA bookstore this weekend. At $30 a pop, I assume Vick will make a hefty profit off this – even if he writes reeeeeally slooooowly. The manager of the bookstore “said the current Philadelphia Eagle will be donating ‘a portion of the proceeds’ to a local charity”, adding that he hopes that local charity will be an animal shelter. So how much would you be willing to pay for Michael Vick’s autograph, knowing that a portion of your money might be going to a local animal shelter? I’d rather spend my time and money at the local animal shelter directly, so I know for sure what’s happening with my cash. Plus the pets at my local shelter let me walk right up and fawn all over them anytime I like – for free.